With HPC, experience and expertise matters. NAG is one of the very few organizations that have genuine proven expertise and experience in HPC. Companies of all sizes and public sector organizations around the world trust NAG to help define HPC strategy, demonstrate cost-effective HPC service delivery, evaluate technology options, migrate to new technologies, achieve improved application performance, and provide HPC user support services. NAG has a breadth of HPC experience and expertise that combines skills found in large HPC centres with specialist business focused HPC skills, and experience gained from an unrivalled track record of HPC consulting projects. Proven Computational Science and Engineering (CSE) support services for academia and industry. Includes code porting, optimization, parallelisation, scaling, refactoring and training. Help with the whole planning and acquisition process including requirements capture, service architecture, technology evaluation, procurement, contract negotiation and acceptance. Impartial expert testing and analysis of hardware and software performance, enabling evidence based technology decisions and budget planning. A numerical algorithm library developed to harness the performance gains from the shared memory parallelism of Symmetric Multi-Processors (SMP) and multicore processors. The EU POP (Performance Optimisation and Productivity) Project helps analyse software and recommend improvements with a focus on HPC and parallelisation. NAG is the leading international center-of excellence in business and technical aspects of HPC. 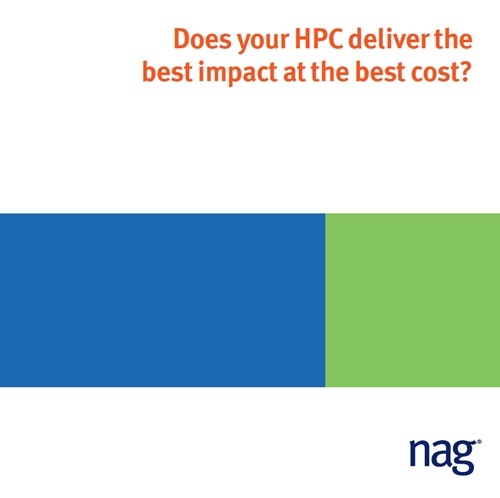 NAG brings expertise, experience, and impartiality to help you deliver the best HPC service, evaluate technology options, acquire HPC systems, make your applications go faster, understand your competitive position, train users and managers and ensure best impact at all costs. NAG and Intel® collaborate to develop proto-apps to improve performance for users of high performance codes. Load balancing issues uncovered by NAG (via the POP project) in a particle tracking application. NAG (via the POP project) audits computational chemistry software for Software for Chemistry & Materials (SCM) and suggests code improvements to communications scheme. Performance of Atmospheric Chemistry Simulations (GLOMAP/TOMCAT) Enhanced by CSE Team. NAG helps a software company refactor their desktop application to make use of HPC systems for Oil & Gas pipeline simulations with remote visualization. Parallel algorithms at Queen's University, Ontario - Why the NAG Library for SMP & Multicore? NAG's CSE Team Quadruple Performance of Quantum Monte-Carlo Application - CASINO. CSE Team Enhances Speed and I/O Performance of Oceanography Code - NEMO. CSE Team Quadruples Speed and Enhances Scalability of Key Materials Science Code - CASTEP. NAG HPC Team Members blog about their experiences from code optimization, supporting users of HPC systems and giving training. Learn more. NAG is a regular exhibitor and presenter at global HPC events. We also host training courses and webinars to help guide users of HPC. See our event calendar. NAG’s Technical Support Service is provided by a team of specialists in numerical and statistical software development, in fact the development team share responsibility for the support of our software and services. We strongly believe that in order to effectively support complex software the technicians must be both experienced and understand the intricacies of the computational techniques. This conviction is reflected in the composition of the team most of whom are qualified to PhD level and have combined experience of software support in excess of 50 years.